It's significantly darker each morning as we take Gypsy and Billy out for a morning walk. We're out well before sunrise now, which was at 07:29 on his first morning with us, it is at 08:04 today - just a fortnight later - and will be at 08:16 by 31st December. Only from 1st January does it start getting lighter earlier in the mornings. It's commonly - and correctly - thought that the days get longer from 21st December, or there abouts, so why does it still get darker in the mornings for a further 10 days beyond then? It's because it starts staying lighter in the evenings from about today (10th December), and by around 21st the evenings are getting lighter quicker that the mornings are getting darker. I understand this offset is caused by the wobble on the earth's axis - probably (but I've not done the maths) the same wobble that causes the seasons. There's a table of sunrise, sunset and day length figures [here] if you would like to look at the data. Gypsy and Billy are both black dogs. So this makes it rather difficult to photograph them and show how they're getting on during their morning walks. A black shape against a dark grey background flying past us indicates where one - or other - of them is, and, yes, there's enough predawn light to make them out in the distance. A very good friend told me when Gypsy arrived that "a Lurcher will always stay with you, but a Lucher's definition of 'with' may be more liberal than yours", and we have learned with Gypsy that she's always got her good eye on us - even a field's width away. Billy has been through a number of homes, feels less secure at the moment, and stays significantly closer. But it is good to see him moving, well far enough away to run - to make great high speed circles around us and the field. And there comes another problem with taking a low light picture ... by the time the camera button's been pressed and the exposure has been worked out, the dog's no longer in the area that the camera is pointing at. However, these days we have cameras built in to our computers - much used for video calls and meetings via Skype, and there's a toy called "Photo Booth" for recording stills too. 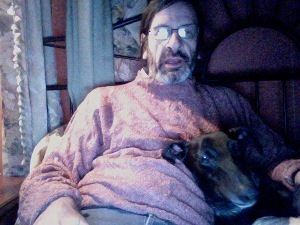 Here's Billy and me answering an email on Thursday evening. 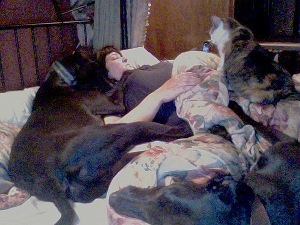 And here's Lisa taking a few quiet minutes with Gypsy, Charlie and Billy - I turned the computer around to capture this one! As I write this, Billy is again supervising. It's 06:20, so an hour or so before we'll be getting up. Gypsy's snoozing at my feet, Charlie and Lisa are already risen, catching up on a backlog of paperwork which has built up (I wonder why?) in the last two week. I start a Learning to program in Python course tomorrow - and indeed I have a pick up from Melksham station, for delegate, for the course at 15:48 this afternoon. And from Thursday onwards (through next weekend), I have a Learning to program in Lua course that I'll be presenting.